Having performed the role of Partner since 1984 and head of Russell Brennan Keane since 2004, Liam has recently handed over the mantle of leadership in the Firm to a new Managing Partner at a time of exciting growth and expansion of the Firm. Liam will continue as a Director assisting with the implementation of the Firms growth plans and bringing his experience as a leader and expert financial adviser to clients of the Firm. A Fellow of Chartered Accountants Ireland, Liam is an expert in strategic business planning with over 35 years’ experience advising domestic and international businesses. He specialises in devising plans that help businesses succeed at home and overseas. 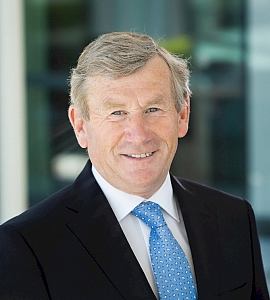 Outside the Firm Liam is Vice Chairman and a Board member of the Governing Body of Athlone Institute of Technology and serves on the Chartered Accountants Regulatory Board Quality Assurance Review Committee. Liam is a non-executive director of a number of private companies.